A lark of an exploratory trip that had everything to do with being outdoors on a rare sunny day and checking out an obscure prospect in our own backyard. This brief trip was strong in novelty, but weak in allure. There should usually be enough water to paddle this. Time: Put in at 2:30p. Out at 5:30p. Wildlife: Sandhill cranes, osprey, hawks, turkey vultures, egrets, muskrat, wood ducks and deer. In lake-centric Dane County, we don’t have a whole lot in the way of creeks or rivers. At least paddleable ones. So how is it there’s a Door Creek in Dane County that we haven’t paddled until 2017? Because paddling Door Creek is like changing the engine out of a clunker that’s been under the cover in the backyard the last couple winters: something you feel obliged to do, even though you know that it really won’t be worth it. Because it never is. But still you do it. This modest prospect has been on our to-do list for years now, simply because it’s so close to where we live and we’ve driven over it literally hundreds of times now, each time being reminded “Oh yeah, we should actually paddle that sometime…” Moreover, the surrounding landscape is quite easy on the eye. This is drumlins country – the teardrop-shaped hills receding glaciers left. So, even if the paddling itself was a touch humdrum since it’s all straight (not to mention the exceeding likelihood of dodging obstructions on this redheaded stepchild of a stream), it seemed like there’d be decent enough payoff visually. Plus below County Road MN there’s virtually no new development anywhere, instead just a wetlands environment that’s mostly public land for 3 miles. And there’s always a novelty of paddling a stream that enters a big old lake. After scouting every single bridge from County Roads T to MN (the last bridge before the lake), we determined that every portion of the creek upstream of Femrite Drive was either impossible or spectacularly impractical. Door Creek begins elusively near the whispered hamlet of Seminary Springs (east of Madison’s far-east side), goes under I-94, then through Door Creek Park (which in theory would be awesome, but it’s not at all paddleable here), a series of downed trees one might affectionately call “woods”, under Highway 12/18, then under I-90, and finally finds its destiny at Lake Kegonsa’s north shore in between a county park and a state park (due east, incidentally, of where the Yahara River feeds Lake Kegonsa), after an arduous journey of 13 whole miles. If you’ve never heard of a creek this close to Madison, there’s a reason for that omission; it’s more a fool’s errand than a paddleable creek. For another, it should be called Door Canal more than Creek, for the stream is almost entirely channelized for agriculture. In other words, instead of following a naturally meandering path, Door Creek looks like the plumbing underneath your kitchen sink: all straight lines and right angles. Where is this 8th marvel of Man vs Nature? You’d have to know where to look for it on I-94, but it’s pretty noticeable on I-90, in between the Ho-Chunk Casino and the exit for County Road N. There are a half dozen or so town road bridges going over the creek, but these would be known only by locals or commuters. Leaving aside the subjective bits how it was the first sunny day in like 12 days of gray in a row, that we were paddling with friends, and that it’s always fun to go somewhere brand new so close to home, the only truly remarkable aspect of this short trip is the 3-mile segment from County Road MN to Lake Kegonsa, which is to say half of this trip. While somewhat monotonous and entirely flat, it’s pretty much all undeveloped wetlands. 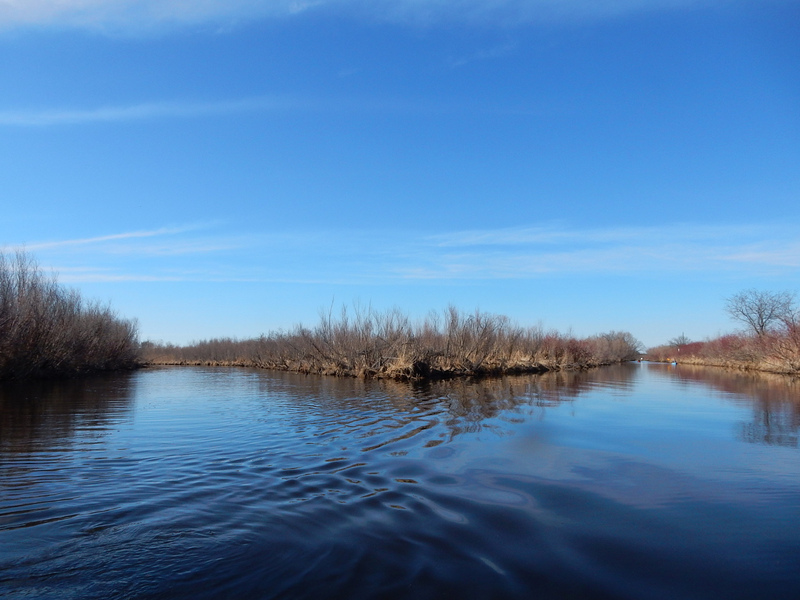 Other than the Deansville Marsh surrounding the Maunesha River, there’s really nowhere else in Dane County that we’ve been to that feels so isolated and wild while being on the water. It’s all very open and spacious, which gave us much-appreciated sun soaking. It’s also naturally clear of obstructions, which also was much appreciated. Perhaps not surprisingly, our wildlife sightings were quite good, even though we were a party of three and pretty chatty. The accesses at Femrite, Siggelkow (always loved that name!) and County Road MN are all accommodating. None is a dedicated landing, of course, but each is totally doable. Of the three, Siggelkow is the quietest road (although parking is imperfect, since the road has a steep pitch). And taking-out at Fish Camp County Park was a snap. There, you can use the official boat launch ramp, but technically you’re supposed to pay for it. Or just get out using a dock near the preserved shack buildings, which is what we did. I don’t know if we “liked” this per se, but it bears mentioning somewhere. Throughout the day, before we arrived at Fish Camp County Park to rendezvous and then we returned 3.5 hours later at the end of our paddle, there were hordes of randomly ambling individuals staring at their phones, otherwise looking like they were sleepwalking. Sure, it was a nice day and all, but this county park really has no function other than fishing or boating. So, to see dozens of people walking in pattern-defying dazes while starting at their phones the whole while was a bit bemusing to say the least. We had to inquire what was up. Apparently there was some sort of Pokemon thing happening. Let me (Timothy) just come out here and disclaim that I honestly don’t know what this means. Have I heard of Pokemon? Yes, admittedly. (The rock I live under isn’t that large…for better or worse.) But beyond that I don’t know jack. Neither do I own a smart phone, so there’s that. Anyway, it was kind of amusing to watch this spectacle going on. I mean, whatever it takes to get people outdoors on a sunny day is a good thing, even if their motivation is less than natural… or even real. But whatever. Who wants to take the first stab at this? Was it the curiosity-killing straightness of the artificially channelized stream itself? The muddy water (aka “eau de mud”)? The lack of current? The hundred obstructions requiring clipping, snapping and sawing? The surprisingly underwhelming views of anything in the surrounding landscape, despite the proximity of aforementioned drumlins? The equally underwhelming outlet of the stream into Lake Kegonsa? How about all of these? To be fair, we knew that the creek would be rigidly straight and we had every reason to predict that there would be clusters of obstructions. The turbid water wasn’t surprising either, since this creek has been butchered for agriculture. We were disappointed, however, by the absence of hills. Not necessarily surprised, because often when hills are only in the near distance and not upfront, they’re better appreciated via the road in a car, if at all. But still, when that was one of the primary arguments for doing this beyond “well, we’ve never done it and it’s really close, so why don’t we just do it already?”, it was a let-down. All this said, we did not have to portage once, which is actually remarkable, given how much a hot mess this body of water is. We did do a lot of maintenance on it, which is why it took 3 hours to paddle 6 miles of straight lines. You know, for all those future paddlers who will be rushing to this hidden wonder tucked underneath I-90. Now that Door Creek has been checked off the list, it won’t be soon when we return. Still though, what we’d do again is put-in at County Road MN and paddle to Fish Camp for a cocktail hour paddle or even continue to the Yahara River either upstream to McFarland since the current is slack and most of it is Lower Mud Lake anyway or downstream into Stoughton. The put-in at Femrite Drive. What you see is what you get: a channelized stream with some small hills in the backdrop. Obstructions lie in wait immediately after putting in. Fortunately, some of the deadfall is forgiving. The banks will alternate between open and cluttered. One of the rare glimpses of small hills from the water. Most of the farm bridges have plenty of clearance beneath them. And then others, not so much. Approaching Highway 12 in a cool little woodsy corridor. Entering the fun tunnel beneath Highway 12. Do not go gentle into that good light. Coming through on the other side. Siggelkow Road, not only is an awesome name, but a good alternate access point. Getting swallowed by a tree. Sometimes a hilly landscape is better appreciated during the shuttle than from the water. The bridge at County Road MN. Seriously? This is pretty much in the middle of nowhere. Below MN the landscape is a mix of meadowlands and marshy wetlands. Most of the surroundings below MN are undeveloped. Minus a couple farm bridges. The railroad bridge is the last of the many bridges on this skimpy 6-mile trip. Taking advantage of a rare side channel. The landscape in between the RR bridge and Lake Kegonsa is pretty wild. Entirely undeveloped surroundings at this point. At the downstream side of the side channel looking up. Again, at least it’s photogenic. The power lines are the only signs of civilization. There’s a large osprey nest at the top of the tower. The mouth of Door Creek at Lake Kegonsa. The fee-costing boat launch at Fish Camp County Park. Or take out for free at one of the docks. This is where the Yahara River enters Lake Kegonsa, incidentally. Gentle hills during the shuttle.